When Mayra Aldás-Deckert moved to the U.S. from her home in Ecuador in 2005, she, along with the rest of her family, was undocumented. “We moved here, like everybody else, with a hope that my sisters and I would have a better future, a better education…better economic opportunities,” she said. For seven years, Aldás-Deckert lived in the shadows. In 2012, she married an American and got a green card, which gave her permanent residency status. Last December, at the age of 31, she became a citizen. She cast her first vote in an American election in the New York State primaries in April. Almost a million people have applied for U.S. citizenship since the beginning of 2016. This marks a 23 percent increase over the same period in 2015. Citizenship applications are historically higher in election years, and this year, between October 2015 and June 2016, applications were up 8 percent over the same period in 2012. Many immigration advocates across the country tie Donald Trump’s anti-immigrant policies and rhetoric to the rise in applications. Aldás-Deckert is now a community engagement coordinator at the New York Immigration Coalition (NYIC), an advocacy organization that represents over 200 groups working with immigrants, refugees, and asylees. She says that fear of a Trump presidency has motivated many of New York’s Latinx residents to become citizens and voters. A combination of her admiration for Hillary Clinton and her deep dislike of Donald Trump motivated Patricia Pavez to become a U.S. citizen and register to vote in this election. 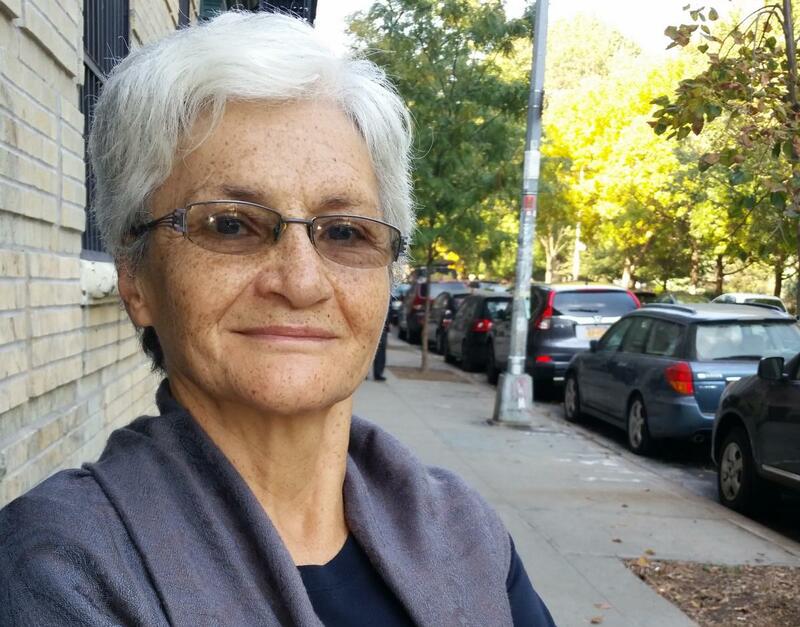 Pavez, who has lived in New York City since moving from her native Chile in 1978, said that the stakes in this presidential election are higher than she’s ever seen them, both for the U.S. and the rest of the world. Due to the spike in citizenship applications and a lack of preparedness at the United States Citizenship and Immigration Services (USCIS), almost 500,000 residents nationwide are currently awaiting answers on their applications. 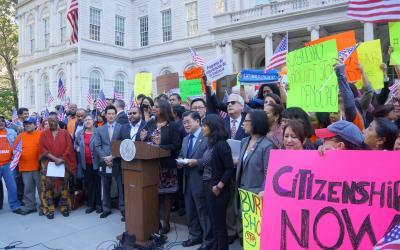 New York City’s Public Advocate, Letitia James, is calling on President Obama to provide emergency support to USCIS to speed the review of applications, 60,000 of which belong to New York City residents. “Not only do these individuals deserve their citizenship, their absolute, indisputable right to live in this country, but they deserve the right to vote,” James said at a press conference on October 5. NYIC communications manager Thanu Yakupitiyage called the backlog “disheartening” and hypocritical, noting that the White House Task Force on New Americans has actively encouraged lawful permanent residents to apply for citizenship. While the majority of New York City’s three million foreign-born residents are citizens, about 500,000 are undocumented. Roksana Mun is an organizer with Desis Rising Up and Moving, a group with almost 3,000 predominantly South Asian and Indo-Caribbean members, the majority of whom either have green cards or are undocumented. Mun says that much work remains to be done to help non-voting residents play more active roles in shaping policy. Mun noted that many struggle to see meaningful differences between candidates and political parties in their policies surrounding immigration, racial justice, and workers’ rights. Aber Kawas, the youth lead organizer at the Arab American Association of New York, works with undocumented individuals to engage them in policy advocacy efforts. The Association holds workshops on the fight for the $15 minimum wage, immigrants’ rights while interacting with law enforcement, and how to be involved in the public education system. “We don’t want voting to be the primary focus for people. We want to talk about the many ways that you can be politically engaged,” Kawas said. In July, Mayor Bill de Blasio expanded the number of languages that voter registration forms are translated into from 11 to 16. Eighty percent of citizens with limited English proficiency should now have access to registration forms in their native language, according to the Mayor’s office. City polling places will also be required to have ballots translated into these 16 languages. While this is a step towards greater enfranchisement — and legally mandated under the Voting Rights Act — many advocates say it is not enough to get immigrant citizens actively engaged in the political process. But Awawdeh thinks the most significant barrier to political engagement in immigrant communities is a lack of civic education. “This is all about education, if you can’t educate people about why this is super important for them to do, then you’re failing,” he said. Mun doubts the expansion of language access will make a substantial difference in voter engagement this fall. Kawas says that many individuals in the communities she works with have never participated in the political process before, either in the U.S. or their home countries. Immigration advocacy and organizing groups have worked hard throughout the fall to register and educate as many new voters as possible and are planning aggressive get-out-the-vote efforts leading up to Election Day. Mohammad Razvi, executive director the Council of Peoples Organization, told The Indypendent that his team has registered more voters, most of whom are South Asian immigrants, than ever before in the organization’s 14-year history. James Hong, who directs the MinKwon Center for Community Action, said that his coalition is knocking on thousands of doors and calling tens of thousands of people. The 19 organizations that the MinKwon Center works with expect to collectively contact over 100,000 Asian-American voters by November 8. “We’ve been training other organizations, refining a message that will speak to our communities,” Hong said.